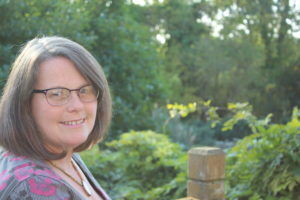 Lisa Pidgeon runs arts for health workshops and projects across Leicestershire, via her organisation Little Bird SOS. 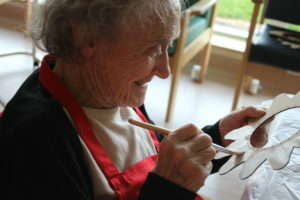 Creative activities are a remarkably useful for improving health and wellbeing, particularly for those feeling isolated. In this post I share my experiences starting Little Bird SOS, an organisation that facilitates arts for health community groups in Leicestershire. Isolation exacerbates any mental health problem. If you are anxious or depressed, feeling isolated will make it worse. My own weekly arts for health community groups developed following redundancy in 2010. Prior to that, I had many years of experience as a qualified adult nurse. Being made redundant can be very stressful, and added to this we were in the midst of a global financial crisis, so there was a general sense of needing to be very careful financially. 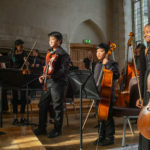 I decided to take a bit of a break and spend the summer being with my young children; my eldest child had just been diagnosed with autism, so I wanted to be around my children more. But honestly I have to say, this was a dark period of my life; the uncertainty for the future for us all, and in particular for our now disabled son, took its toll. But as can be the case with darker times, there were also some really positive things to come out of my redundancy. Over the summer of 2010, I noticed a significant improvement in my son’s behaviour and I realised that being at home more was positive for his future health and wellbeing. I also re-discovered my love of crafts and had picked up a variety of textile and yarn based projects that helped calm my mind and pull me through some dark moments. I eventually decided that I would like to try my hand at teaching others, and was testing out the idea of carving a new career path that would allow me the flexibility of being closer to my children, while also contributing financially. I started off by teaching crochet in a local cafe. 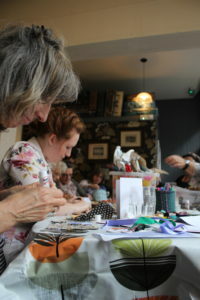 Through this I was able to see first-hand the connection between arts and craft and benefits for health and wellbeing. I was keen to expand, but I knew nothing about running a business. So I subsequently secured a mentoring programme with a local arts organisation, Creative Leicestershire. I was assigned an experienced mentor (who still supports me today), and I was funded to attend the first International ‘Culture, Health and Wellbeing Conference’ in Bristol. This reinforced my belief that my path was the right one. Fast forward to 2018 and the organisation I started, Little Bird SOS, has come a long way. 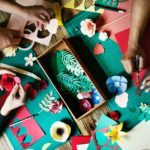 We now run two regular weekly art and craft workshops, called Revive, for anyone wanting to improve their health and wellbeing and I also work on a variety of similar projects. Revive sessions are delivered to small groups of individuals by myself, with support from experienced volunteers. We create craft items using a range of recycled materials – and this sense of sustainability seems to help with emotional sustainability too. Participant feedback indicates increased confidence, improved mental health and wellbeing, greater social connectivity, overcoming social isolation and a reduction in negative thoughts. Alongside the weekly sessions, I also deliver short term projects too. Currently I am working on a project called Inc.Arts, in collaboration with Leicestershire Partnership NHS Trust and funded by the Big Lottery, where we are translating our Revive model into community hospitals coaching staff on how to deliver arts for health sessions, to improve hope and optimism for older people in hospital, whilst at the same time giving them the skills to think about how they can do this sustainably. It’s a relatively new concept, but heart-warming to work with newly created ‘Meaningful Activity Coordinators’ who will ensure the impact of this project will continue long after my intervention period with them ends. From the onset it became clear that a friendly and unforced and strictly non-judgemental approach encouraged companionship, shared experiences and even friendship. This approach also encouraged a diverse range individuals together to take part. 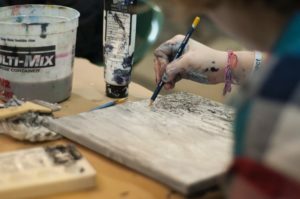 The actual art activities were diverse and interesting enough to hold attention and inspire, but the ensuing conversations, group engagement and good humour that seemed to develop out of the art activity became fundamental to our aims. We have brought groups of people together into a room, ‘making and doing’ and allowed the relationships and companionship to flower and bloom. Much of this is familiar common sense, for example, it is well known that a great many people take part in group learning activities, WEA courses, ‘Night school’ etc. in order to meet and interact with other people, it is seldom just the learning that they are after; they usually want human interaction too. Last July, the All Party Parliamentary Group on Arts, Health and Well-being published their Creative Health: The Arts for Health and Wellbeing inquiry report. Within this, there is well documented evidence showing the cost benefits of delivering this kind of activity along with 10 recommendations and next steps to change thinking and practice opening the way for the potential for arts for health in the future both in a clinical and community settings. For me, this kind of legitimises and confirms that the work I do in my community, is not just about doing something ‘nice’ but really reaching out to people and giving them hope and optimism whilst at the same time improving their mental health and wellbeing. Find out more about Little Bird SOS via http://www.littlebirdsos.co.uk. 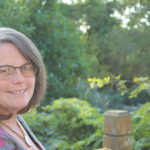 Thank you so much to Lisa Pidgeon for contributing this inspiring post. 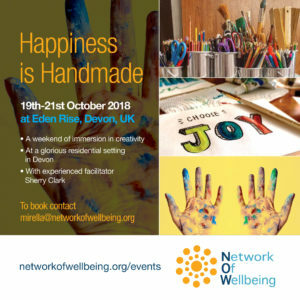 For those interested in arts and wellbeing you may like to join us at our upcoming Happiness is Handmade Weekend. Full details here. 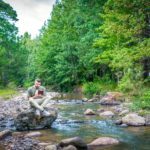 What Does Literature Tell Us About Nature and Wellbeing?